CC Event #91 is going on now! Compete today through Fri, 1/25 to tip the scales in your country club's favor and win these tee markers and flags. CC Event #91 runs 1/24-1/25 with multiple 4-hour Clashes, so be sure to play as many games as you can for your club and keep your eyes on the leaderboard. We're extending our New Year celebrations into CC Event #90 this week! Compete with your country club today through Fri, 1/11 play to win these 2019 tee markers and flags. CC Event #90 runs 1/10-1/11 with multiple 4-hour Clashes, so be sure to play as many games as you can for your club and keep your eyes on the leaderboard. Here's a free bubbly gift to help you ring in the new year! We're giving you free Champagne Ball Effects today (12/31/18), just for logging in. This festive ball effect adds the sound of a cork popping and a bubbly vapor trail to all your shots, making each one a celebration. *Special offer for WGT players who log in and play on 12/31/18, receive free Champagne Ball Effects (50 hits). 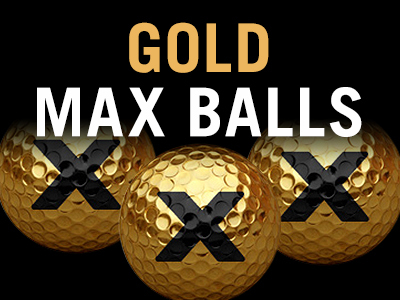 Gold MAX Balls are back -- for a limited time! Get 3 of the player-favorite Gold MAX Balls FREE today when you buy 2,000 or more WGT Credits. Slow down your swing meter and add some flash to your game with these special edition MAX balls, then use your new credits to upgrade your virtual equipment or compete in paid games for prizes. These aren't available to buy in the Pro Shop so don't miss your chance to add them to your bag! Note, the free Gold MAX virtual golf balls will automatically be added to your inventory but not automatically equipped. To use them, just open your Equipment and equip them from your inventory. *Special offer for players that buy 2,000 or more WGT Credits today through tomorrow (12/27/18-12/28/18), receive 3 Gold MAX virtual golf balls (Hack+). Offer valid on one 2,000 or more WGT Credit purchase only during the promotion. 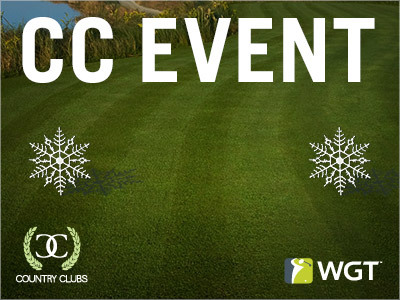 Compete with your WGT Country Club today in CC Event #89! 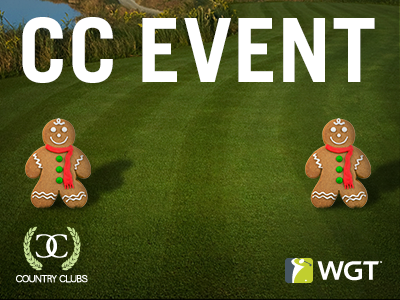 Today through Fri, 12/28 play to win these tasty gingerbread cookie tee markers and flags. CC Event #89 runs 12/27-12/28 with multiple 4-hour Clashes, so be sure to play as many games as you can for your club and keep your eyes on the leaderboard. A holiday gift from us to you! Happy Holidays from WGT! We've got a free gift for you today, just for logging in. 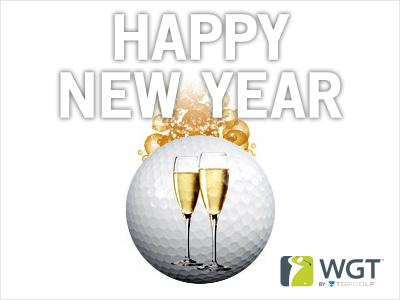 You've done all your shopping and wrapping, now you deserve a golf break! 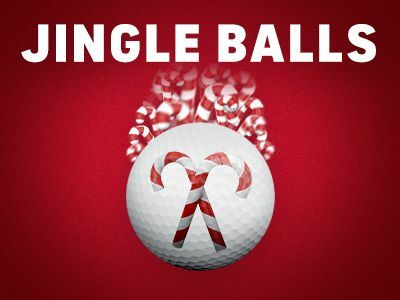 Play today, 12/25 and you'll get free Jingle Ball Effects to make your next rounds extra festive with a flying candy cane vapor trail on all your shots. *Special offer for WGT players who log in and play WGT on 12/25/18, get free Jingle Ball Effects (50 hits). We've got some exciting updates today to close out the year, including the NEW COURSE you've been hearing so much about! 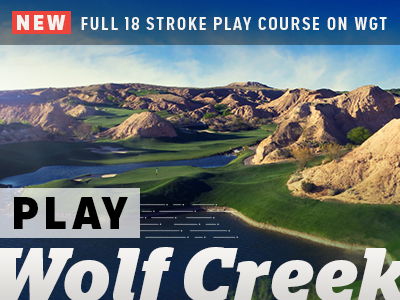 Introducing the newest WGT course, Wolf Creek – now available in full stroke play! Experience all 18 holes of this stunning golf course, featuring extreme elevation changes and challenging (but beautiful) terrain. Be one of the first to play this new course by logging in now! There's a new top tier in town! Introducing: Tour Champion tier. Now the highest possible in the game, players have a new tier to move into based on number of rounds played and average score as usual. Who will be the first Tour Champion? New year, new Virtual Tour! Start the year strong by competing in the Chambers Bay Open. This is the first tournament of the new year, kicking off on 1/1/19. Post your first round score by 1/25 to move on to the single-play final round. The top 70 combined scores in each Pro-Tour Champion tier will split the total purse prize of 125,000 credits. Plus, the winning players in each Pro-Tour Champion tier of each monthly tournament will display a new "reigning champion" icon next to their player name through the following month. Winter is here...in this week's CC Event! 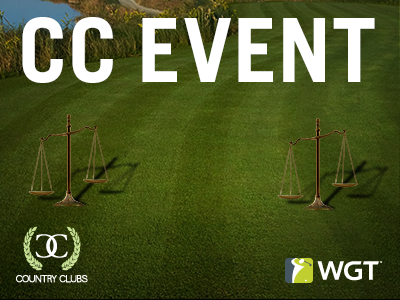 Compete with your WGT Country Club today in CC Event #88! Today through Fri, 12/14 play to win these snowflake trophy tee markers and flags. 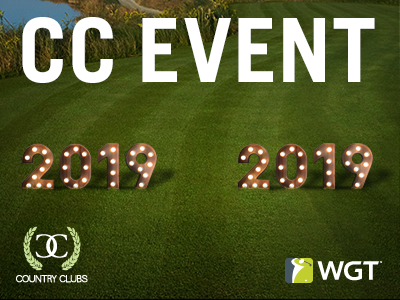 CC Event #88 runs 12/13-12/14 with multiple 4-hour Clashes, so be sure to play as many games as you can for your club and keep your eyes on the leaderboard. 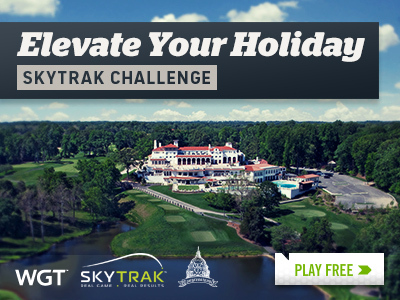 Play this month's SkyTrak Challenge, plus a special offer! Compete in the Elevate Your Holiday SkyTrak Challenge on WGT this month for a chance to win an Amazon gift card! Play as many times as you want to post your best score in this month-long tournament, and both the top leaderboard score and a lucky sweepstakes winner chosen at random will each win a gift card prize. Also going on now, our friends at SkyTrak are offering you special holiday pricing on SkyTrak devices to elevate your game at home! With this personal launch monitor, you get instant 3D shot analysis and ball-flight data, plus the WGT integration lets you play your favorite mobile golf game with your own clubs. *Tournament is open to all WGT players, see rules for details and eligibility. 'Tis the season! 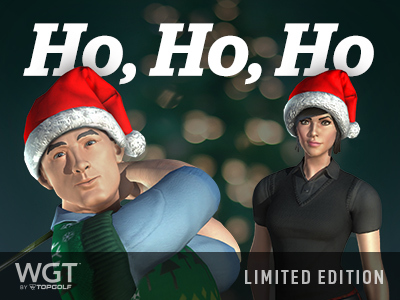 Check out the new limited edition holiday apparel, available now in the Pro Shop on WGT Golf Mobile. 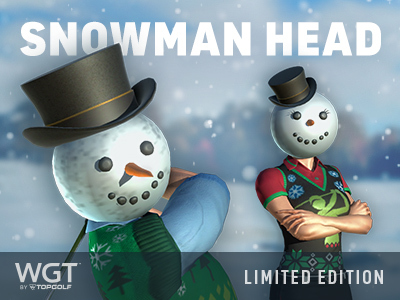 The Snowman Head is back, even classier and more chill than before, sporting timeless top hats. 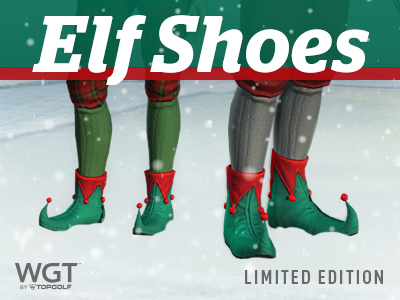 Treat your avatar to the most comfortable golf shoes available this holiday season! Ho, ho, ho! This classic red Santa Hat will spread holiday cheer and keep your (virtual) head warm this winter, so get it before it's gone. 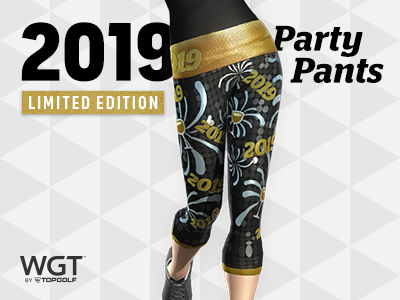 Ring in the new year with these limited edition Party Pants for some real flair as you say goodbye to 2018. All of these items are available to buy in the Pro Shop and you’ll get both male and female versions, to match the avatar you have equipped. They're only here for the holidays so don't miss out!